The sills of the car are constantly exposed to negative external influences. Reagents, gravel, bumps and chipped paint damage and contact with moisture 9 months of the year and temperature changes complement the business - the metal rusts. But do not despair! Digest rusted the threshold to anyone. Remove the rusty threshold. To do this conveniently with the help of ordinary grinder. First, cut the threshold along the seam of racks, and then finish launched with the help of chisel and hammer.Upon completion it is necessary to clean the box, on which is mounted the verge, rust and remnants of the old threshold. The welds should also be ground. Use emery paper or go to all rusted areas with a drill with sanding attachment. Prepare the amplifier threshold to be installed on the car. Using metal shears cut notches in the places where the amp will be set against the car stand. You also need to make holes in the places of the future spot welding. This can be done using the same scissors, metal. Install the amplifier threshold. Secure it in place using the quick strobino, magnets or rivets. After the amplifier is securely fastened to your future place, and you will see that everything is made and cut correctly, and weld the piece with spot welding. The application of this type of welding will help to avoid the thick and unsightly seams, and thus facilitate their alignment. Grind the excess metal after welding. Prepare to install the new threshold. It should be to do the same as with amplifier: cut with scissors the excess metal in the region of the uprights, fit the threshold to the body, and make holes for welding. The edge of part and the front part should be slightly bent inward to facilitate the installation. Weld a preset threshold. Secure the threshold in the same way as the amplifier in the previous steps. Weld the new part with spot welding process and joints: their sleet to grind, it is possible to cover the rust inhibitor and zashpatlevat, to smooth out all the bumps. After the filler parts should be oshlifovat again. Paint the new threshold. To start otshpatlevyvayut cover the surface one or two layers of primer. When the primer dries, apply the item several layers of paint and finish the job, covering completely dry surface varnish. Do not cover newly installed amplifiers anti-corrosion composition prior to the installation of the actual threshold, because the composition will smoke during subsequent welding work. Many motorists prefer to make processing new thresholds gravel composition before the application of paint to protect the car from stones flying from under wheels. However, remember that the paint coating applied over the gravel composition will look less attractive. 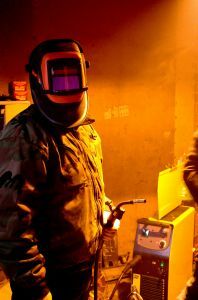 If you don't have a welding machine, try to negotiate with a master welder that will do the preparatory work and fitting parts yourself, and ask weld to sekonomit.